Yesterday I showed you the cars, today a glimpse of the importance of dressing for the occasion. Lovely detail shot for atmosphere, many would miss this. Is he an elf? Those socks are pilling. I hope he knows how to darn. My grandmother used to darn socks over an egg-cup. I love these kind of details! He's a dedicated driver! Black shoes with brown socks? Oh, the humanity! And those are some ridiculous shoes. "Wing Tips" refers to the decoration on, not the length of the toe. Did he buy these from Peregrin Took? The Velcro® is another nice touch. Was this guy driving a Hybrid Albion? Great shot! That has to be a theater costume he's wearing if there's velcro on it, it's the only way to get costume changes done quickly and efficiently! Oh! I love that! How prim and proper he looks! Great shot and interesting comments. It looks like your viewers and you all had your magnifying glasses out . . .
Class act. 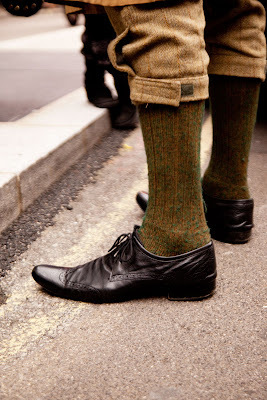 Love the shoes, socks and trousers! Drivers in the California Mille wear vintage clothing during the race. Looks like fun. Vintage cars and dress. What a HOOT!